Register for the 2018 Holiday Challenge! The 2018 Eat Smart, Move More…Maintain, don’t gain! Holiday Challenge is open for registration. The 2018 challenge will include, weekly weigh-ins, nutrition tips, and weekly snacks/incentives. Weigh-ins will be each Tuesday at the N.C. Cooperative Extension, Martin County Center at 104 Kehukee Park Road in Williamston NC. 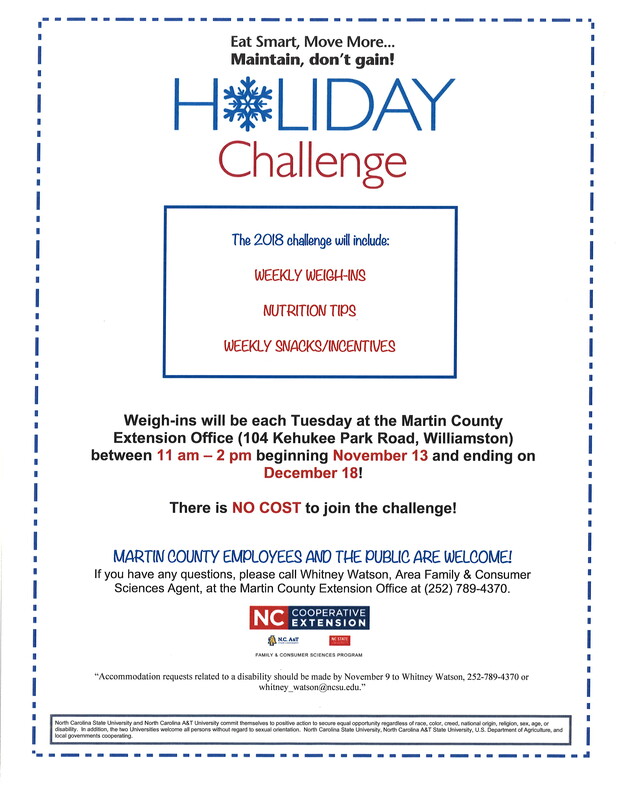 Weigh-ins will be held from 11 a.m. to 2 p.m. beginning November 13 and ending on December 18! There is no cost to join the challenge! 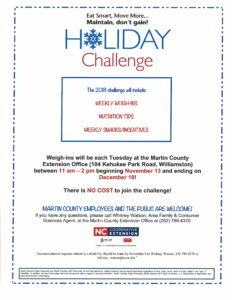 Martin County employees and the public are welcome! If you have any questions, please call Whitney Watson, Area Family & Consumer Sciences Agent, at the office at 252-789-4370. Accommodation requests related to a disability should be made by November 9 to Whitney Watson, 252-789-4370 or whitney_watson@ncsu.edu. • Join the 2018 Holiday Challenge!